Why do some astronauts come back from the International Space Station needing glasses? Eye problems are one of the largest problems that have cropped up in the last three to four years of space station science, affecting 20% of astronauts. And the astronaut office is taking this problem very seriously, pointed out Scott Smith, who leads the Nutritional Biochemistry Lab at the Johnson Space Center. It’s one example of how extended stays in flight can alter your health. Despite NASA’s best efforts, bones and muscles weaken and months of rehabilitation are needed after astronauts spend a half-year on the space station. But in recent years, there have been strides in understanding what microgravity does to the human body — and how to fix it. CO2 levels. This gas (which naturally occurs when humans exhale) is “relatively high” on the space station because it takes more power and more supplies to keep the atmosphere cleaner, Smith said. “Increased carbon dioxide exposure will increase blood flow to your head,” he said. If this is found to be the cause, he added, NASA is prepared to make changes to reduce CO2 levels on station. Folate (Vitamin B) problems. Out of the reams of blood and urine data collected since before NASA started looking at this problem, they had been looking at a biochemical (nutrient) pathway in the body that moves carbon units from one compound to another. This is important for synthesizing DNA and making amino acids, and involves several vitamins and nutrients. After scientists started noticing changes in folate (a form of Vitamin B), they probed further and found an interesting thing regarding homocysteine, a type of amino acid at the heart of this one carbon pathway. It turns out those astronauts with vision issues after flight had higher (but not abnormal) levels of homocysteine in their blood before flight, as published here. “It’s speculating, but we think that genetic differences in this pathway may somehow alter your response to things that affect blood flow into the head,” Smith said. While NASA tries to nail down what is going on with astronaut vision, the agency has made substantial progress in preserving bone density during flights — for the first time in 50 years of spaceflight, Smith added. We mentioned the advanced Resistive Exercise Device, an orbital weight-lifting device which was installed and first used during Expedition 18 in 2008 and has been in use on the space station ever since. It’s a large improvement over the previous interim Resistive Exercise Device (iRED), which didn’t provide enough resistance, allowing some astronauts to “max out” on the device and could not further increase weightlifting loads after some weeks or months of use. “We flew the iRED on station and the bone loss on station looked just like it did on Mir, that is, with no resistive exercise device available,” Smith said. But that changed drastically with ARED, which has twice as much loading capability. Crews ate better, maintained body weight and had better levels of Vitamin D compared to those that went before. Most strikingly, they maintained their bone density at preflight levels, as this paper shows. While we think of bone as being cement-like and unchanging (at least until you break one! ), it’s actually an organ that is always breaking down and reforming. When the breakdown accelerates, such as when you are not putting weight on it in orbit, you lose bone density and are at higher risk for fractures. Why is unknown, except to say that the bone seems to rely on some sort of “signalling” that indicates loads or weights are being put on it. Conversely, if you are to put more weight on your bones — maybe carrying a backpack with weights on it — your skeleton would gradually get bigger to accommodate the extra weight. While it’s exciting that the ARED is maintaining bone density, the question is whether the body can sustain two processes happening at a faster rate than before flight: the breakdown and buildup of bone. More study will be needed, Smith said, to pinpoint whether this affects the strength of the bone, which is ultimately more important than just mineral density. Nutrition and exercise may also be optimized, to further allow for better bone preservation. That’s one of the things scientists are excited to study with the upcoming one-year mission to the International Space Station, when Scott Kelly (NASA) and Mikhail Kornienko (Roscosmos) will be one of a small number of people to do one consecutive calendar year in space. The bone “remodelling” doesn’t level off after six months, but perhaps it will closer to a year. Smith pointed out the quality of health data has also improved since the long-duration Mir missions of the early to mid 1990s. Specific markers of bone breakdown and formation were just being discovered and implemented during that time, whereas today they’re commonly used in medicine. Between that, and the fact that NASA’s Mir data are from shorter-duration missions, Smith said he’s really looking forward to seeing what the year in space will tell scientists. 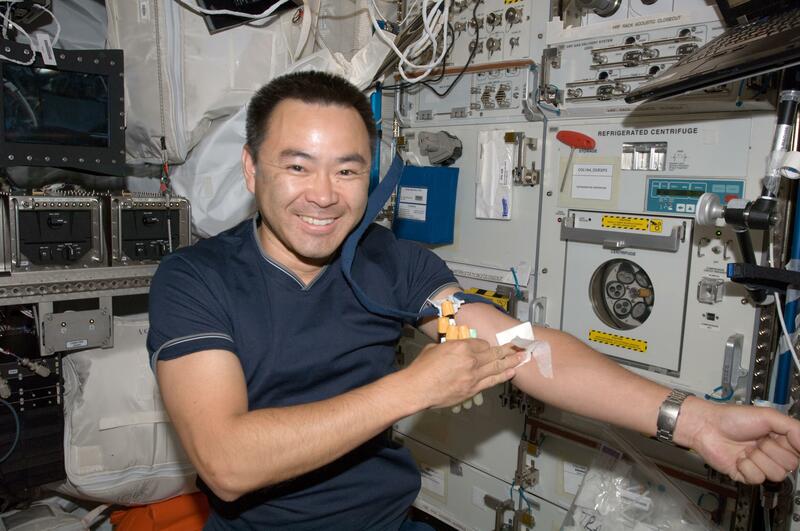 This concludes a three-part series on astronaut health. Two days ago: Why human science is so hard to do in space. Yesterday: How do we make exercises work in Zero G? Sure glad the caption explained what Karen Nyberg was doing. At first glance I thought she was demonstrating a new NASA technique for drying her hair! Instead of trying to cure the many diverse, complex and dangerous consequences of long duration microgravity, it is much easier and safer to cure microgravity itself by using spinning spacecrafts, in long wires, so that they get centrifugal forces which simulate gravity. Since a space station could be spinned in many different speeds, all kinds of gravities could be simulated which would be a very great boom for low-mid-high gravity research, for instance for medical and interplanetary purposes. It is sad that NASA never has done anything of this, and has no plans to ever do it. They instead study in how many different ways microgravity is slowly killing their astronauts. Previous PostPrevious How Much Can Titan’s Sunsets Teach Us About Alien Planets?